So basically after Twitter ditched Twitpic by having their own photo-feature embedded in the tweet box, Noah Everett,founder of Twitpic, recently released his new social network which is pretty much similar to Twitter. An act of revenge ? I dont think so. Heello was announced last year in August and finally it is open to all the users. One would say, its a total clone but there are some differences with it. 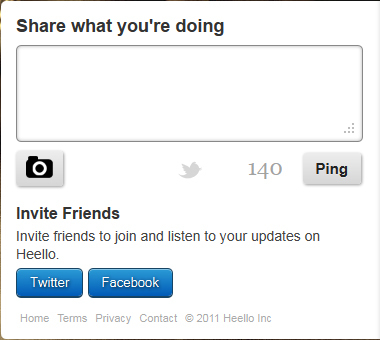 In twitter all the messages that are posted are called Tweets whereas in Heello it is called Pings. The limit of your ‘tweets’ and ‘pings’ are both 140 characters. You can add pictures with your tweets in both of them. 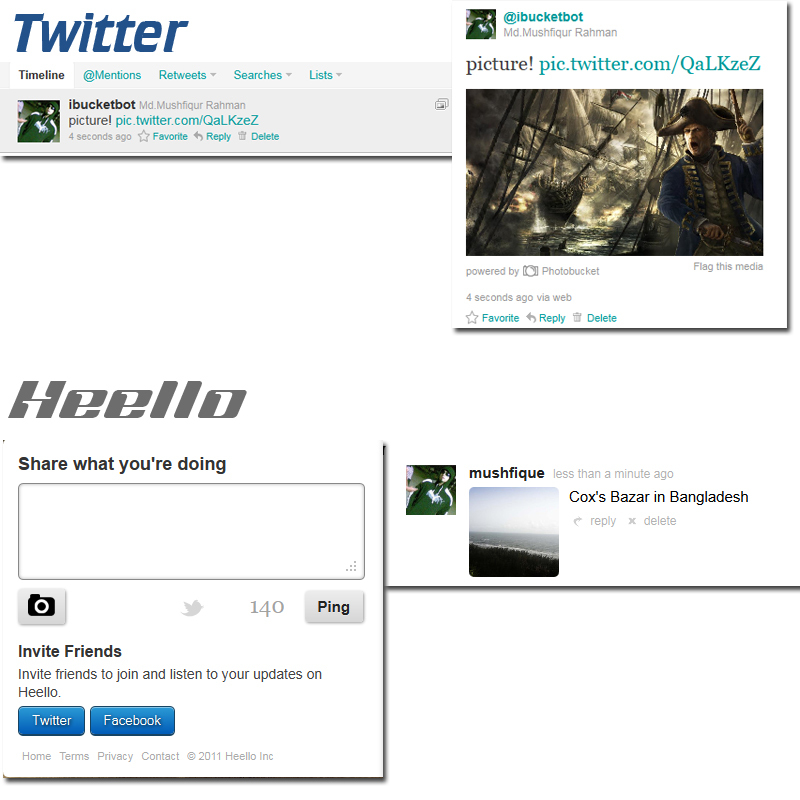 ‘Timeline’ in twitter, and the same is known as ‘What’s Happening’ in Heello. 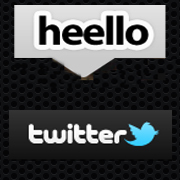 The logo of Heello is a cloud and Twitter’s is a bird. A bird flying with clouds in the sky. Nice combo! What I like about Heello is that once you post the pictures it shows the review of the pic on which you click to enlarge it whereas in Twitter you can only see the link and have to click the next button to see the preview. Well, at least in Heello it saves one step of clicking ! Check the picture below ! On the other hand, you can also have your pings get tweeted in Twitter at the same time ! You just have to click the small birdy icon in the middle of the camera and the ping button. Now, according to the users, what makes Heello addictive in their release is the ‘Whats Happening’ Tab. In this tab, you can see all the pings of the people pouring down like water in each second. Interesting I must say. But once I started using it I knew that this feature would not last long due to the influx of the users in this site and I was right ! As their users kept increasing and increasing, the pings in the ‘Whats Happening’ tab started pouring down like a waterfall, and as I predicted, it was temporarily disabled. The server wasn’t able to cope with the pressure obviously! Why wait ? Start Pinging and Listening! I didn't know much abot heelo till now! thanks for the share.